This scary beastie is a digi from Dustin Pike (again! lol) and coloured with Promarkers. My backing paper is again from my Crafter's Companion Autumn/Winter cd and the little gems I have had since I started cardmaking!! I never found a use for them as they always looked 'wrong' but they are so right for this card! ... I think ;) I even made the card base myself... never did it before but it turned out just right...phew! Dang! My post disappeared. I must not have followed all the directions and got 'chucked' out. Anyway - here is a summary. Love the card. He is as scary as a Muppet - but I won't tell him if you don't. The background IS a wee bit frightening however. Well done. Love the title. Trouble is - I think he's smiling!! Well done on fitting all those challenges, blimey. Great card. What a fab scary monster. Love the image & the bat paper. It's fab. Thanks for joining us at PFP. Super cute Halloween card! Love the background paper! Thanks for playing along with the Treehouse Challenge this week! 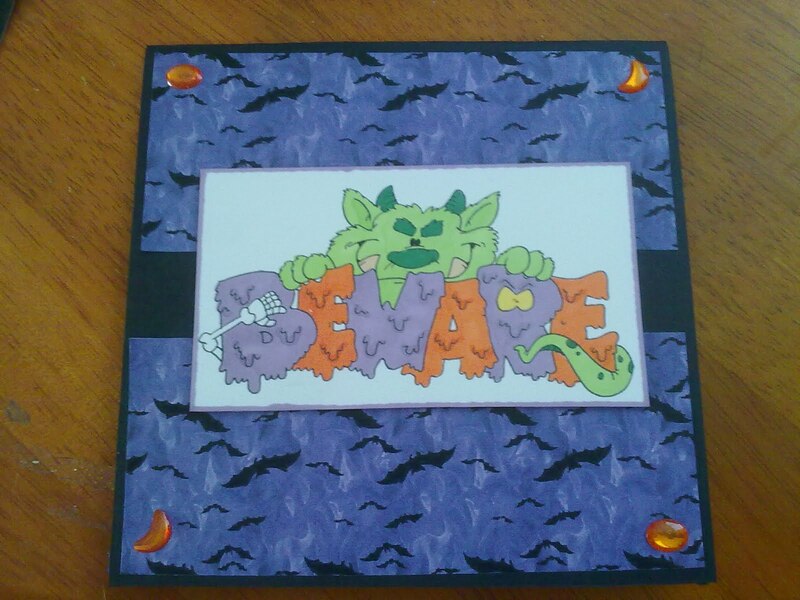 Great card...love that scary monster! Thanks for joining us at FFC! Great job on your scary monster! :) That bat paper makes the perfect background. Thanks so much for joining us this week at Digi Doodle Shop's Best! Fabulous card. Thanks for joining us this week at PfP, good luck. 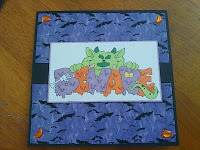 Ooohoooo.... FAB spooky Halloween card. Love the paper you have used! Thanks for joining us at Digi Doodles Shop`s Best! How spooky and kewl this is Gail, thanks for playing along with the "spooky color" challenge over at Treehouse. Great card :) Thank you for joining us at PfP this week, and good luck. Great, that is so wonderful. Thank you for playing StemeplMagie.